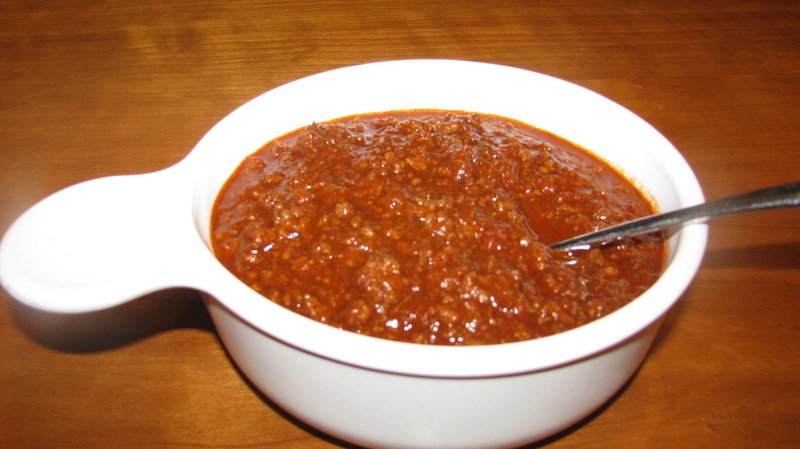 This is my mother-in-law, Dotty's Chili recipe. It is quick and yummy. She says she does not use beer, so I'm not sure when I added that step, but it gives the chili a good flavor. Don’t use a light beer. If you double or triple this recipe, be careful with the chili powder. It seems to me that chili powder intensifies the more you add. The strength of chili powder differs greatly. It depends on what kind you use. Sounds delicious! I especially love chili when it's chilly outside. Love your Blog, El! Reminds me of a chic version of Julie and Julia. Always looking forward to see what's up next. I didn't read the tips and tricks until after I had tripled this recipe used three cans of light beer and 3/4 C. of chili powder. By then, it was too late, but I brought it to a pot luck supper, and it received rave reviews. Tonight, I cooked the chili with lean ground beef and cooked the seasoning vegetables with the ground beef in the same pot at the same time. So, I didn't to cook the vegetables in oil in a separate pot and didn't have to drain the ground beef. Also, I added some red wine (since I was drinking red wine), and the result was delicious. I've made the chili with turkey and Gab and Donald didn't care for it. I thought it was OK. I have made 5 lbs. of meat with 1 C. of chili powder and it was so hot and spicy we could hardly eat it. The only reason I put "Don't use a light beer." is because it has more depth of flavor with out. Light beer is still better than water in my opinion. I'm enjoying hearing different ideas! Thanks. I don't know what's more expensive, eating out or cooking meals to take pics for the recipe book. It sure is fun being the husband and eating lots of GREAT meals. SO, if I don't have beer, use an equal amount of water, right??? Also, do you recommend any particular chili powder? I am going to make this for Monday Night Football tonight since the weather turned a little cooler!!! Yes, use water. I don't buy expensive Chili Powder and I don't like the DARK Chili powder, but I'm not loyal to one particular brand. Trying to make it lower sodium 8). SO, I used low sodium beef broth and water for the 24 oz of liquid (doubling the recipe). Everything else the same. Preliminary taste tests are that it is delicious!!! I also have the salt free Tony's I am going to add... Thanks for the help, Chez Helene! !